Last time Taoiseach Enda Kenny began moves which led to the replacement of a Garda Commissioner, it started a chain reaction. It was followed by the loss of a secretary general in the Department of Justice, and later the departure of the Justice Minister, with controversies which still resonate. This time, in any moves concerning the future of Garda Commissioner Nóirín O'Sullivan, the chain reaction could go all the way back to Government Buildings and Mr Kenny's own office. Questions will even be asked about whether this minority hybrid Coalition can survive the loss of Commissioner O'Sullivan. The Government, especially Mr Kenny and Justice Minister Frances Fitzgerald, have continued to express their confidence in Commissioner O'Sullivan. Fianna Fáil, which has been more equivocal in its support up to now, has finally kicked over the traces. Fianna Fáil leader Micheál Martin yesterday said the Garda Commissioner should consider her position following the latest revelations surrounding the force. Nobody needs reminding that Mr Martin and his colleagues underpin this minority Government and a number of bizarre political possibilities now beckon. If Sinn Féin pushed a Dáil no-confidence vote in Commissioner O'Sullivan, Fianna Fáil would have few options but to support it. The Government has lost more than a dozen such Dáil votes without much consequence beyond looking pretty limp. But could the Government directly go against an injunction of the parliament to which it is answerable? And, recalling that one translation of An Garda Síochána is the "Civic Guards", could the head of such a civilian police force remain impervious to such parliamentary censure and brazenly remain in office? Last Saturday, Nóirín O'Sullivan began her fourth torrid year at the head of An Garda Síochána. She took over on an interim basis from her predecessor, Martin Callinan, who was forced to leave in a hurry, on March 25, 2014, and was confirmed permanently in the post the following November. We should not forget that she is the first woman garda to ever head the force since its foundation in 1922. While the force has been mired in controversy under her leadership, she has insisted that no blame ever attaches to her. That is now beginning to wear thin as the public questions where, and if ever, responsibility starts and stops in the national police force. She has strongly and repeatedly rejected allegations of being involved in the smear campaign against whistle-blower Maurice McCabe, and has also sidestepped a number of other controversies. 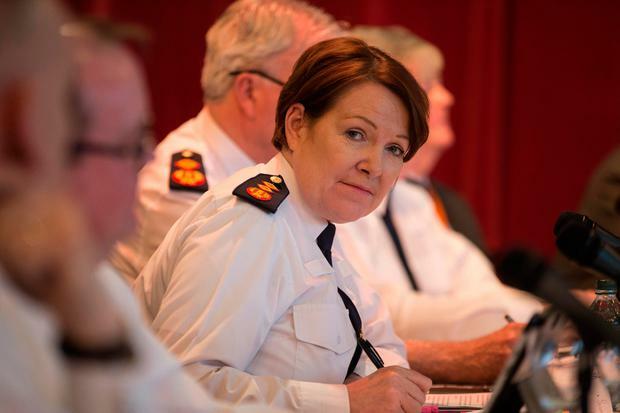 But last week's revelations concerning wholesale fraud about the number of Garda drink-driving checks, and widespread incompetence within the force in handling road traffic prosecutions, suggest that Commissioner O'Sullivan may finally be running out of road herself. It is hard to believe that errors by gardaí have led to more than 14,000 drivers being incorrectly prosecuted for a range of motoring offences. Taxpayers will very probably have to stump up compensation which may not end with just repaying court fines and resultant insurance company loadings. There may be resultant cases of jobs and livelihoods missed out upon or lost, where drivers were wrongly disqualified from driving. These examples of incompetence are distressing enough. But revelations that gardaí routinely exaggerated the number of roadside breath tests carried out between 2012 and 2015 are quite alarming. The sheer scale of this exaggeration, just short of a million reported checks which were never carried out, is dismaying and hits at the heart of the force's image for credibility and integrity. The Policing Authority emphasised these very points in an extremely hard-hitting statement last week. In reality, the Garda Pulse system recorded 1,995,369 breath tests as being carried out during the four years in question. But the Medical Bureau of Road Safety found that the real number was 1,058,157. The fraudulent inclusion of an additional 937,212 tests in the Pulse system was an effort to show the force was more vigilant and active than it was. But the Policing Authority also stated that the whole issue "raises concerns about management and supervision". The authority also said the scale of the discrepancy "is further evidence of deep cultural problems with the Garda". So what did the commissioner herself have to say about all this? Well, she expressed her disappointment, reiterated the issue of the force's trust and integrity being on the line, and called on each individual garda to step up to the mark with the highest standards. But Commissioner O'Sullivan explicitly stated that these were historic matters which she had already addressed through a policing reform process which is ongoing. In fact, she went on to caution that her shake-up of the force is likely to expose further failures. "When an organisation like An Garda Síochána is on a journey of radical reform, it is inevitable that we will identify more examples of bad practice," she continued. But that did not wash with Fianna Fáil and Micheál Martin. He said his party was not satisfied by the response of the commissioner, nor indeed with statements from An Garda Síochána, and the Justice Minister. The Government's response to this farrago has been deficient. Frances Fitzgerald said on Friday that she made it clear to the commissioner that the practices that allowed this misreporting to happen within An Garda Síochána over many years need to be addressed. Surely a statement of the blindingly obvious. On Saturday, attending EU 60th anniversary celebrations in Rome, Mr Kenny said both sets of revelations were "not acceptable". But he notably reaffirmed confidence in Commissioner O'Sullivan. Thereafter, Social Protection Minister Leo Varadkar and Agriculture Minister Michael Creed also reiterated the mantra of confidence in the commissioner. But how tenable that Government stance may be as we enter a new week remains to be seen. The reaction of the Independent Alliance in Government will be watched closely. John Halligan has already raised concerns.